The following is a contribution from Kendal of Hassle Free Savings. If you would like to contribute to Frugal Rules, please see our guidelines and contact us. The recent Groupon-Starbucks drama further cements how much people love their gourmet coffee. The popular coffee chain’s deal for a $10 eCard priced at $5 was so highly coveted that Groupon’s website couldn’t handle the traffic. Over 100,000 offers were purchased within one hour, and a brief site crash led to more than a few negative tweets and Facebook rants. Daily deals notwithstanding, buying lattes on a consistent basis can cost an average of $80 per month. Life is too short to drink bad coffee, yet brewing quality java at home can also eat into your budget. As a self-proclaimed (and third-party acknowledged) coffee snob, I’ve come up with the following ways to save on my daily habit. A good cup of java starts with the beans, and nothing beats freshly-ground coffee every day. Coffee grinders run anywhere from $9 to over $200, so there’s likely a device out there that fits within your budget. My husband and I were gifted a nice Krups coffee grinder, and later saw it at Sam’s Club for half its normal selling price. We purchased it as a backup — yes, we’re that obsessed with good coffee — but so far we haven’t had to use it. Paper coffee filters aren’t exactly budget killers, but they are unnecessarily wasteful when a proper metal filter costs less than $10. Plus, the flavor of coffee is richer with gold filters because not as much oil is lost to absorption during the brewing process. When it comes to brewing gourmet coffee at home, there’s nothing worse than overestimating consumption and pouring a few cups of liquid gold down the drain. Single-serve coffee makers are a great antidote to this problem, but require an investment. Shave the cost of these devices by purchasing them with discount gift cards. Cards to JCPenney, for example, can be purchased for up to 18% off their face value through GiftCardGranny.com, and used to buy popular Keurig-brand coffee makers, and supplies for less. It’s a popular misconception that freezing coffee keeps it fresher longer. In fact, storing coffee this way can make your daily brew taste like the other contents of your freezer, as coffee beans are porous and can absorb flavors easily. Additionally, coffee’s distinctive flavor is due in part to the oils released during the roasting process, oils that are diminished when frozen. Instead, store your coffee in a well-sealed opaque container, preferably in whole bean form in your pantry. Regardless of your attitude about shopping at Walmart, you can find gourmet coffee for less at your local superstore. A 12 oz. bag of Starbucks Sumatra roast sells for about $0.73 per ounce, compared to $0.83 per ounce at Starbucks. Natural or specialty food stores are another great source for gourmet coffee blends. For example, World Market has a multitude of tasty beans from around the globe for much less than coffee chains, and frequently offers 10% off coupons. Single-serve coffee maker owners lament the expense of all those coffee pods they need to feed their habit. However, you can find them just about anywhere including Bed Bath & Beyond, where you can obtain their ever-present 20% off coupon for solid savings. Additionally, you can order pods from Amazon in bulk and sign up for their “subscribe and save” program for extra savings. Some friends of mine recently shared similar stories about replacing coffee makers. Each friend received a free or deeply discounted replacement to their recently deceased brew-masters by contacting the manufacturer and inquiring about options. Since this offer was extended by two different companies on separate occasions, reaching out seems like the best first step when your coffee maker bites the dust. Whether it’s a rewards card or a loyalty punch pass, being part of your favorite shop’s program will likely provide free birthday coffee and other perks (pun intended). World Market Explorer members can earn free coffee with accrued credit, with purchases on Wednesdays earning double points for faster redemption. Similarly, registering your Starbucks card can earn you free refills and exclusive coupons. Do you like to drink a good cup of joe? What are some of your favorite ways to save on making gourmet coffee at home? Editor’s note: Mrs. Frugal Rules and I are self-proclaimed coffee snobs and learned something from Kendal’s post today. You can brew gourmet coffee at home without having to spend a lot of money in the process. Kendal Perez is a bargain-shopping blogger for HassleFreeSavings.com where she shares personal stories about her pursuit of savings. I don’t drink coffee but my BF loves it so I got him a grinder and espresso machine for Christmas. Thank you for the tip about freezing coffee, we do that as we live in Guatemala in a remote place and buy 3/4 months worth of coffee. We thought it was better to freeze since it is hot and humid where we live but you have a point about absorbing smells. I learned about not freezing my coffee while researching for this post! It makes total sense and I’m now storing my whole coffee beans in opaque containers in the cupboards. I bet your boyfriend loves his morning espresso – grinders make all the difference! Growing up, my parents drank Folgers, Maxwell House, pretty much whatever was on sale. (They taught me a lot about bring thrifty.) My first major job was an assistant to a woman who worked out of her house. Her husband had invented some coffee roaster and they always had really high quality beans in the house. Imagine my surprise drinking my first cup of GOOD coffee! When I got pregnant, I had to give up caffeine, and tried lots of decaf coffees, trying to find one that wasn’t horrid. Enter Costco. They sell a bag of beans under their own name, but roasted by Starbucks. (The Kirkland brand in the blue bag.) I think it is 2 lbs for $13? This bag brews up such a tasty cup of coffee that I haven’t looked for a new brand in more than 7 years. I have to go now, I am at my sister’s house. A nice steaming cup of Maxwell House awaits me. Sigh. Holly is a big coffee drinker. She recently cut down from 8 cups to 3 cups a day:) Luckily, she actually prefers the cheap stuff, but maybe she’d like it more if we could brew it at home. Also, I’m so glad that you mentioned the coffee in the freezer issue. Personally, that is always a pet peeve of mine. Ha! Holly sounds like my dad — he’s never without a cup of coffee. It’s possible she’ll cut down even further if she starts drinking quality coffee, since one cup of the good stuff is arguably equivalent to a few cups of the bad. My husband and I recently took advantage of a buy-one-get-one-free deal from Starbucks on their Tribute blend. We bought four 1-lb bags of whole beans for $30, which is roughly $7.50 a bag. Unheard of for Starbucks! I totally want a Keurig but I’m still hoping to just win one in a giveaway : P Maybe I should try to review one for a company and do a giveaway on my site….kill two birds with one stone…. Anyway we brew coffee every day and I’m completely addicted. Two years ago I couldn’t stand the stuff : ) Brewing at home has definitely saved us hundred (or thousands!) of dollars. Keurigs are great! I never used one before I started working in my current office and it really does a great job. If the review and giveaway don’t work out, definitely look for deals during the holidays and consider the discount gift card tip I offered – it’s an awesomely simple way to save money! Excellent post, my wife and I are also avid coffee drinkers but I learned a lot from this. In particular I never knew that about freezing it. What about putting it in the fridge, same effect? From what I’ve read, storing coffee in the refrigerator makes it susceptible to absorbing all the amazing smells floating around in there. That means you coffee may taste like broccoli, fish or whatever else you have in your ‘fridge. No good! I’m glad you found the post useful! I sometimes wish I liked coffee. People seem to enjoy it so much, but I’ve never found any I could drink without making it mostly sugar and creamer, which seems to defeat the purpose. Coffee is definitely an acquired taste. I didn’t always like it and I’ve only recently started to enjoy it in it’s natural form (no cream, no sugar). If you really want to give it a chance, try a lightly brewed medium blend roast. These are definitely good ideas and ought to save folks some money! I would simply add, get an aeropress coffee maker. They are incredible little machines that have people swearing up and down for them! I’ve never heard of an aeropress coffee maker but since you mention it, I think my parents purchased one for their RV to use when camping. It seems like a neat gadget and if my coffee-addicted father approves of it, it must be good! You know how to ensure your coffee tastes good? Don’t use a coffee pot with a burner to keep coffee warm… use a pot that brews into a well-insulated thermos. I stand by my Zojirushi coffee maker and have gotten two more people on the bandwagon. Zojirushi is famous for their well-insulated thermoses and hot water pots and rice makers so they a) know how to keep coffee hot and b) know how to boil water to the right temperature. Secondly, ALWAYS look for 100% Arabica or 100% Colombian coffee. Anything that doesn’t say this has robusta beans in it, which are very sub par coffee. Costco’s Kirkland brand of coffee (already ground) is amazing and stays fresh if you put it in a couple ceramic rubber-sealed latch containers. (I use three so the coffee in the other two containers stay as fresh as a sealed can while I use the third). Great tips, Tara! I’ll have to look at my coffee reserves to see if they’re 100% Arabica or Columbian. Since you’re the second person to recommend Costco’s Kirkland-brand coffee, I simply must try it now! I have a Keurig and I love it! Get the taste of great coffee without paying the ridiculous prices. I never used to like or drink coffee before my son was born, but then I needed it. My wife and I grind our own beans at home and use a gold filter. It is so cost-effective and you can’t beat the taste. We get great beans and they usually cost less because they are whole. I love coffee from home and usually won’t buy it when I am out. I have never been a fan of starbucks coffee, it always tastes burnt. I don’t know why people drink that crap. Ha! My mom is not a big fan of Starbucks coffee either — just a bit too strong and bitter for her liking. I’ve acquired a taste for it but I am interested in branching out. Their coffee is expensive and my husband would love to find a low-cost alternative that tastes just as good. Grinding whole beans and brewing with a gold filter are absolutely key to a good cup of java. I’ve stopped buying coffee when I’m out and about now that I drink it black. Waste of money! With you completely on the gold filter; a $10 investment will make better coffee more efficiently. Right? This totally blew my mind when my former boss recommended it to me. Who knew such a small change would make such a big difference. Plus, no more fussing with soggy, dripping filters. I don’t drink coffee, but these tips seem like great ideas. Coffee is addictive and unhealthy so I’m trying to hold off for as long as possible, but I’m sure water will only last so long. Coffee is unhealthy when you add creamer, sugar and all the other crap that goes into frilly drinks these days. If you can enjoy it without all the additives, it isn’t bad for you. It’s high in antioxidants and is reported to help protect against some diseases. That being said, not a day goes by where I see conflicting reports about the benefits of coffee — one day it will kill me, the next day it will add years to my life. All things in moderation, right? For some reason I’ve never been able to consistently brew a good cup of coffee. I have a grinder, a real filter, etc. I must have a block in that part of the brain or something. I might have to try the Costco brand though. Seems like it’s got a few good reviews. Ha! Perhaps you haven’t found the right coffee just yet, so trying that Costco brand is a good start. What about your coffeemaker? The cheap one we used to have always left coffee grinds in the bottom of the pot, so every cup we poured required a little chewing. Bottom line, it made terrible coffee and we should have replaced it much sooner than we did. You might consider upgrading your coffeemaker if this sounds familiar. Rick loves coffee too, and gets a big bag of Colombian Supremo from Sam’s Club, and we have a cheap ($15) bean grinder. We’ve done coffee this way for years, and guests always rave about our coffee. I’ve recently gotten back into drinking coffee regularly. We have a Keurig, so I felt like the single serve filter is a must since the K-cups are, at best, $0.50 a piece. I am definitely ok with using generic brands as well. Generic brands are key to saving money on K-cups. I’ve seen daily deals for them now and again so that’s another way to score them for less. Thanks for commenting! You are right, there are so many ways to make good coffee at home these days. I have never had a coffee in my life but my husband enjoys it. A few years ago we bought an Automatic Espresso machine on sale so that he could make his own Venti Caffe Mocha each morning. I just use a french press. It works well enough for us. I like the Keurig single serve thing, but seems like the coffee would be more expensive. So I never seriously consider it. We bought a French Press a few years ago but mostly use it while camping. 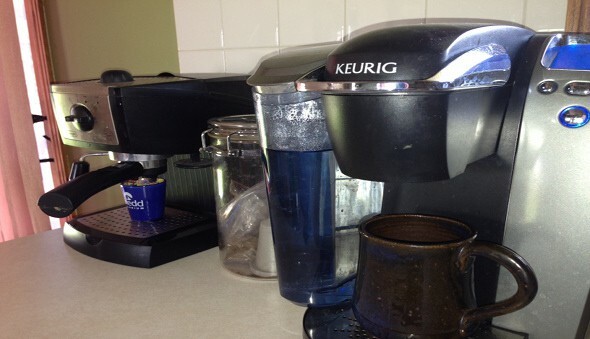 It does provide a bold and tasty cup of coffee and is much less expensive than a Keurig! Great tips! When people cut back, coffee is one of the first luxuries to go, but then they buy the cheapest coffee and can’t stand the taste. So off they go back to the coffee shop. I always tell them to buy a good quality of coffee, otherwise you’ll never to stick to it. 🙂 Thanks for the tip on not storing it in the freezer. It makes sense when you think about it. Great point, Shannon! Going from one extreme (coffee shop) to the other (bad homemade coffee) is a recipe for disaster when it comes to sticking to a regimen. Brewing good coffee at home is the perfect solution. The difference between homemade and buying in a coffee shop sort of blows my mind. That said, I’ve never been much of a coffee drinker, but love tea. Sadly, buying tea at restaurants and cafes was one of the first things to go when I got serious about paying off debt. It’s amazing how highly marked-up drinks are at restaurants. I always get water even if I’m craving something else (unless it’s a special occasion). I think tea you purchase yourself is often much better than the stuf they offer in restaurants, anyway! We don’t get into all the fancy gourmet coffees but we do own a grinder which we put to good use. We buy tins of coffee or instant coffee. On occasion if we have coupons we buy the gourmet coffee which sometimes means we have to grind it. Although, most shops these days have an instore grinder so it’s not always a necessity to have. Instead of spending money on coffee every day at the local shops i’d rather spend a bit more on decent coffee to enjoy it at home for a fraction of the cost. I did that coffee comparison blog post and it was alarming the difference of making it vs buying it. Good point about the grinding service offered by coffee shops. I find that grinding beans fresh everyday is ideal but I understand how snobbish that sounds! I completely agree that spending a bit more on coffee at home is preferable to forking over several dollars for a latte. We buy pods at Costco to save by buying in bulk. For work, my husband has brought in a percolator! A percolator is legit! My mother-in-law started brewing her coffee this way after doing so on a camping trip. She couldn’t bring herself to return to the regular coffeemaker because she loved the taste produced by the percolator. I’m surrounded by coffee snobs! I have a Nespresso machine at home, which I got for my birthday, and it`s the best thing ever! It makes such good coffe, and it`s sooo incredibly simple! It`s not the most frugal thing, but it`s one of the few things I splurge on, since I stay at home so much studying on my own. I bet the Nespresso will last you for years and will end up saving you money in the long run! If it puts a smile on your face and only a small dent in your budget, why not? I buy whole bean coffee at CostCo for $.56/oz. I splurged on Starbucks for $.62/oz recently. Coffee is one id those items wre you can really get a deal at Coercion. I definitely love my coffee. I typically buy Seattle’s Best or Starbucks but I only brew a couple pots a week. I never heard of the cold filter either I’ll have to check that out as well. I’ve been using the paper filter for a long time but if I can get one that is reusable I could see how it would make things a lot easier. I highly recommend the gold filter, Chris. You’ll notice a difference immediately! I love coffee but I don’t need the gourmet stuff. I don’t have the patience to make it, or buy it for that matter, so I just drink a normal cup of java. My brother has a Kurig and he loves it. Different strokes for different folks, right Daisy? If you’re just as content with inexpensive coffee as you are with the pricey stuff, more power to you! My dad loves good coffee but is similarly disenchanted with how expensive it is. As long as he has a cup of java within arm’s reach, he’s a happy camper! I love a good, strong cup of coffee. We grind our own beans every morning, but I have a bad habit of brewing more than we’ll drink. I really need to reign myself in, because I’m literally pouring money down the drain…especially when we pricey coffee from Stumptown! I use a french press to make my coffee and I’ll splurge on Starbucks a couple days a week. I have to give love to one of my favorite shopping place in Coscto here. There “inhouse” espresso is actually put together by Starbucks. Since I worked for Starbucks for a small time, I can tell you it is almost the exact same as the branded espresso in those stores. But at a much better price.